Q&A: What happens when an employee does not use their vacation entitlement? In this conference Q&A, we address the alternatives when an employee chooses to not use their vacation entitlement in the vacation entitlement year as prescribed by law. In partnership with Stringer LLP, First Reference Inc. recently hosted the 19th Annual Employment Law Conference on June 12, 2018, where we discussed the latest legal developments on topics including practical compliance strategies in light of Bill 148. While the law is clear in theory, its application tells many stories as employers and HR professionals deal in the practical world of differing employment dynamics. In this conference Q&A, we address the increases to vacation entitlements brought forth by Bill 148. The three popular articles this week on HRinfodesk deal with: Wages by occupation, 2016; The risks of mischaracterizing an employee as an independent contractor; and Employer ordered to pay over $53,000 for unpaid general holiday and vacation pay. 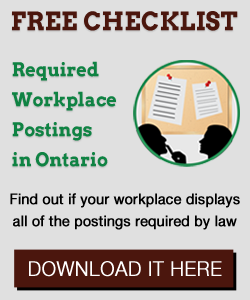 The three popular articles this week on HRinfodesk deal with: Vacation entitlement changes in Nova Scotia; reduction in the employment insurance waiting period; and Ontario Ministry of Labour’s updated workplace harassment guide. When it comes to employment standards legislation, employers must remember that just because an employee agrees to something, that does not make it lawful. More importantly, parties cannot contract out of employment standards requirements, and employers that breach employment standards legislation expose themselves to significant risk, even if the employee in question appears to have acquiesced. This often arises when it comes to overtime or vacation. Three popular articles this week on HRinfodesk deal with: An FAQ in relation to an employer’s obligation to have a casual worker sign off on vacation pay; a case that looks at workplace investigations; and Ontario’s proposal of eliminating the “30% Rule” for pension investment.